This post is dedicated to those students. To the ones who’ve let me in their lives, even just a little bit. To those who’ve laughed with me (and at me), to those who’ve answered my questions (even the stupid ones). Thank you. And for the record, I tremble as I write these words, acutely aware of the multitudes of godly parents who are too busy caring for the hearts of their missionary kids to write an article like this. When I grow up, I want to be like them. They’re not. They’re kids, with unique temperaments, callings, and gifting. If they’ve decided to follow Jesus, then of course, they should be encouraged to do the things that Christians do (invite people to follow Jesus, love people, serve people, etc. ), But God may not call them to the same cross-cultural work as you. Or cross-cultural work at all. And.That.Is.OK. Let them follow God where he leads them, and please don’t be offended if it’s not into full-time ministry. There’s absolutely nothing wrong with sending our kids to local schools, or out with local friends, but if we have the idea that our kids are little “soldiers for Jesus,” we’re playing a dangerous game. 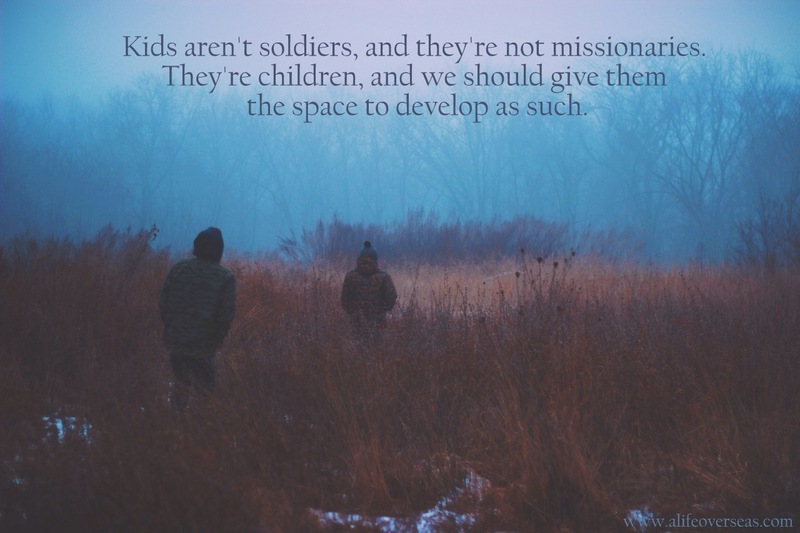 Kids aren’t soldiers, and they’re not missionaries. They’re children, and we should give them the space to develop as such. My dad was a dentist, but I didn’t’ grow up among whirring drills and nitrous oxide (bummer). But that’s the point, isn’t it? I was allowed to grow up. And although I’m sure my dad used the phrase, “You’re going to feel some pressure,” he didn’t use it on me. 2. Be purposeful and strategic. In Missionary Land, there’s a book/seminar/website for everything. We study how to cross cultures and what to do once we’ve crossed. We study how to help the poor without hurting them. We talk about planting churches without building them, developing disciples without dependence. We’re purpose-driven, strategizing, apostolic, visionary, pioneering, missional, culturally-sensitive, community developing, social justice flag-waving, chain-breaking, tired people. But are we as purposeful and strategic in our God-given, God-ordained, role as parents? Do we ponder how to disciple other people’s kids more than our own? We are the first representatives to our kids of what a Christ-follower looks like. It’s an amazing privilege, and it is deserving of attention. You’ve sacrificed a lot to be with the people in your host country. In loving them, listening to them, serving among them, you are aiming to show Christ. Make sure you do the same with your kids. 3. Remember that your MK’s good behavior does not validate your life or ministry, and his or her bad behavior does not invalidate it. This one’s insidious. And devastating. But tying your validation to your child’s behavior (good or bad) is a socially acceptable form of idolatry. It has nothing to do with walking in obedience, and everything to do with looking outside of the Father for approval and validation. All of us are on a spiritual journey. We mess up, find grace, keep walking. But this natural process often gets bypassed for MKs. They show up in churches and are expected to have it all together. No struggles, no sin, DEFINITELY no doubts. Maybe their parents expect this, afraid that a misbehaving or doubting child will threaten their support base. Maybe it’s church people. In many ways, MKs live publicly, whether they want to or not. I mean, how many families in your passport country send monthly or quarterly newsletters to each other? One missionary kid confessed, “I had to be perfect so I wouldn’t mess up my dad’s ministry.” Another girl said, “Everyone thinks I’m better than them.” I asked her to clarify. She said, “They think because I’m an MK I’m more spiritual than them. They also think that I’m arrogant because they think I think I’m better than them.” It’s confusing, I know. The pressure to validate a parent’s life choices is too heavy, and the risk of invalidating a parent’s life choices or ministry is too damning. Missionary kids should not have to carry either burden. If this point resonates with you, I highly recommend the book, I Have to be Perfect, and other Parsonage Heresies. It was written by an MK. May our children know, beyond a shadow of a doubt, that our love for them is immense, never-ending, and flows straight from the heart of the Father. And when they feel our love, may they feel Him. Have you ever felt the pressure to be perfect? What did that do to your heart? Is there any danger in expecting children to be “little missionaries” or “soldiers for Jesus”?